Today’s Gold/Silver Ratio (GSR)—or the number of ounces of silver required to buy one ounce of gold—has many investors wondering if this could be the bottom for both gold and silver. In fact, following their drops to $1,054 per ounce and $13.85 per ounce, respectively, in December 2015, both metals rallied significantly in the months following. As we mentioned above, you don’t have to forsake simplicity to enjoy the diversity of all four precious metals. With the PMC Ounce™, or the Precious Metals Composite, all you have to do to start reaping the benefits of gold, silver, platinum, and palladium is make one simple purchase. Yes, just one. 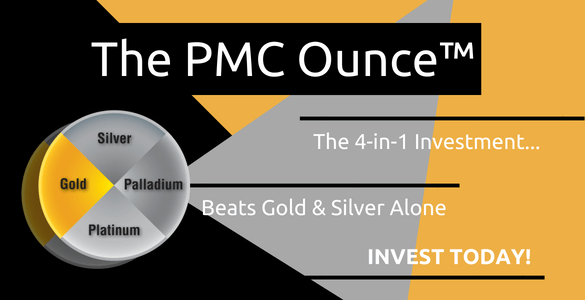 The PMC Ounce™ contains a fixed fractional quantity of gold, silver, platinum, and palladium—all backed by 100% physical metal. This is not a fabricated coin, round, or bar; rather, each PMC Ounce™ is backed by physical metal stored at a secure facility. In fact, if you want to take advantage of the low storage rates available for the PMC Ounce™, you can even store other approved bullion products in the account! Weighted and diversified: Each PMC Ounce™ provides a turn-key, diversified physical precious metal “portfolio” that is logically weighted based on the specific attributes associated with each metal type. Blended return: The price movement of the PMC Ounce™ is directly correlated to the live market price changes of its component metals, thereby delivering a blended return in real-time. The composition of the PMC Ounce™ eliminates the need to attempt to market-time the trading of a broad precious metals portfolio. Volatility control: Gold, silver, platinum, and palladium do not move in lock-step. Therefore, the diversified and blended return for the PMC Ounce™ tempers the higher volatility associated with investment positions consisting of just one or two bullion types. Secure and insured storage: The inventory for the PMC Ounce™ is secured with the insured vaults of a non-bank bullion depository. Real-time trading: The PMC Ounce™ trades in real-time, and its price is directly calculated by the real-time price of each of the component metals. Liquid: The PMC Ounce™ is liquid, and investors in this dynamic asset are just a phone call away from executing a buy or sell order. Convertible for delivery: The PMC Ounce™ offers a simple and easy convertibility and delivery option. Confiscation hedge: The PMC Ounce™ allows investors to combine and capture the benefits of each metal, including store of wealth, inflation hedge, currency hedge, and unique industrial applications. Because the metals that comprise a PMC Ounce™ are stored at a non-bank bullion depository and allocated in the owner’s name, your metals are safe from government confiscation. Regardless of your goals for your portfolio, this is an excellent asset for any well-rounded portfolio. The PMC Ounce™ satisfies a wide range of investing needs, whether you’re looking for greater profit potential, diversification without the hassle of determining the ideal allocation of each metal, a hedge against uncertainty, or an easy way to jumpstart your precious metals portfolio. To learn more about this innovative way to invest in gold, silver, platinum, and palladium, please call us at 800-831-0007 or email us.